Ethnic and cultural background influences an individual’s attitudes, beliefs, values and behaviors. Each family’s characteristics reflect adaptation to its primary culture and the majority culture, the family’s unique environment and the composite of the people and needs within it. If you are a CASA, when you read these reminders you probably think of how Native American cultures inform the ways we manage cases that fall under the Indian Child Welfare Act (ICWA). You may also think of how ethnic differences, religious differences, linguistic differences all affect how a CASA case should be managed. CASAs have been trained to recognize these differences and how they affect families and children. Here’s a graphic way of understanding this, from social scientist Bobbi Harro. 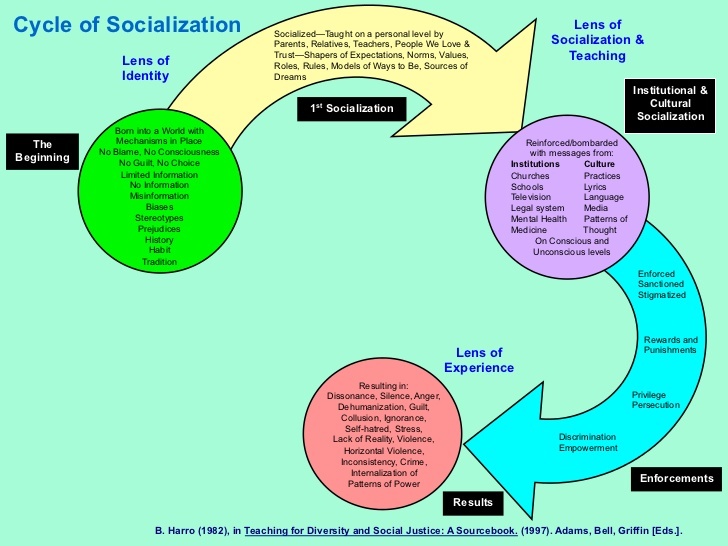 She calls it the Cycle of Socialization. The diagram may look complicated, but the point it makes is simple: from birth people are socialized in a multitude of ways that create a core personality which to one degree or another can feel alienated, sometimes extremely so. Born into the world as a tabula rasa, a “blank slate,” we are immediately subject to the environment we are born into. That environment may be loving, nurturing, and supportive, but just as often as not it expresses structures of oppression over which no one has control. Can we really believe that children born of addicted parents are immune to the social and cultural forces that trapped their parents? We may be born innocent, but the world we are born into isn’t. From birth, we are socialized by the people we love and trust. Over and over, our social roles are normalized: “boys don’t cry,” we are told; “girls should help mom”; “boys should help dad”; “be polite”; “be respectful.” These all seen innocuous enough, but are they? One Christmas many years ago a little girl was given a doll, her only present that year. What a gleeful experience it was for her, but it would be shattered moments later when the little girl’s fiercely devout mother demanded the present be surrendered, to be given to another girl at church whose family had nothing. The little girl was my mother, the Christmas sometime in the early 1920s. My mother lived her next 80 odd years in self-denial and guilt. Imagine what your Christmas present for a CASA child might mean about the roles that child will adopt in life. For children in foster care, institutional and cultural socialization is the most pernicious. The lives destroyed by the institutional and ongoing oppression of Native Americans makes every CASA work extra hard to comply with ICWA. The same can be said for our work with LGBTQ children, minority children, special needs children. Institutional and cultural socialization is not always so easy to recognize, though. I was born in 1946, into a back lot house on Monroe Avenue, down by the sugar beet factory, on the South Side of Billings. Any wonder why I am happy now to live on the West End? There are all sorts of cultural assumptions built into geography. Billings natives know. I have never had a Christmas present taken away, and I have been successful in life. Even so, Harro’s work shows me how hierarchies of power and privilege have affected my family’s history. I am white and privileged. Not all CASA children are. I am cis gender and privileged. Not all CASA children are. I am middle-class and privileged. Not all CASA children are. I could go on, across a multitude of ways that lock me into certain social roles, engender certain expectations about my behavior, canalize my aspirations. Inevitably all of this affected how I raised my children, and so the cycle closes. CASAs need to be cognizant of how our own familial, institutional, and cultural stories can affect the children and families we encounter. Recently I learned that families involved in the system often see their CASA volunteer as a do-gooder who shows up at the trailer court in a Lexus. Not me, I tell myself. But if mom and dad are meth addicts, if their children have gone to school in urine-soaked clothes, if their trailer has backed-up toilets, of course I am a do-gooder. I may not drive a Lexus, but my late-model pickup says something about the privileges I have.